Leason Ellis obtained a favorable settlement in our civil action against Patent & Trademark Association, Inc., a New Jersey corporation, after filing a multi-count Complaint in the U.S. District Court for the Southern District of New York in July of 2017. Our Complaint alleged that defendant had engaged in false advertising, unfair competition, deceptive acts and practices, and tortious interference with prospective economic relations by marketing to trademark owners prospective “publication” of their trademark registrations in a database. T his “service” offered no commercial value, as published trademark information is freely available in the online records of the U.S. Patent and Trademark Office. Our Complaint further alleged that defendant was confusing consumers into believing that the database was legitimate by sending unsolicited notices designed to make it appear as though it was an official government enterprise. In successfully resolving the dispute, we negotiated a settlement in which PTMA is permanently barred from ever engaging in trademark or intellectual property-related activities in the U.S. and in which we recovered several of its domain names including ptma.us (www.ptma.us). This victory follows in the steps of our previous triumphs against other companies whose disreputable practices preyed on unsuspecting trademark owners, as we previously secured consent judgments against Patent & Trademark Agency LLC in 2014 and USA Trademark Enterprises, Inc. in 2012. By vigorously taking legal action to combat these predatory companies, we continue to be an industry leader in the fight for fairer business practices and in the battle to protect trademark goodwill and trust from unjust exploitation. Westchester’s best and brightest took center stage Thursday evening as more than 400 people were on hand to salute the 2017 class of Rising Stars, a diverse and highly talented group representing an impressive array of professions. “These exemplary young professionals have distinguished themselves through their talent, determination, leadership and commitment to the Westchester business community. Their initiative, innovation and drive to succeed have gone a long way toward ensuring that Westchester remains the smartest county in the United States,” said BCW President and CEO Marsha Gordon. The Rising Stars program is modeled after the national business recognition program “40 under 40.” Rising Stars honorees were chosen based on professional and/or entrepreneurial accomplishments, professional and/or business affiliations, and demonstrated leadership skills. Thursday’s event was held in the atrium of 800 Westchester Avenue in Rye Brook. 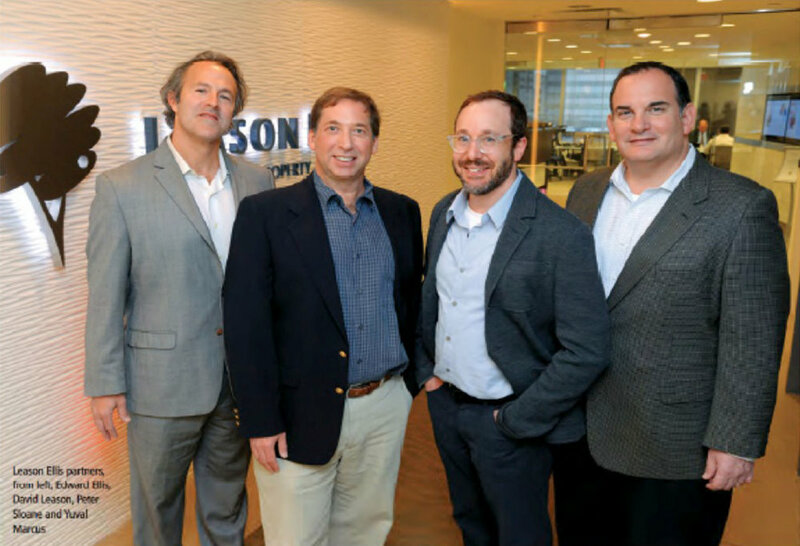 "We love what we do more than anything else," Leason Ellis Managing Partner David Leason says of his Westchester law firm, which specializes in intellectual property law. "It's our passion... it's that simple." That passion caught fire in 2008, when Leason and partner Edward Ellis left their positions at a New York City firm to set up shop in Westchester. As is the case with most startups, their journey was not without a few hiccups. The biggest issue, resulting from the 2008 economic crisis, "was managing cash flow," says Leason. "Payroll for attorneys, paralegals and [to] train individuals is significant. "There was really no credit available," Leason continues, noting that they'd pay the credit card bill daily, to gain back the ability to use it. "We had to build our own capital." Their efforts paid off, as the company has grown from just four employees in 2008 to 50 employees and 1,900 clients today-- including partners in England, Germany, China, Japan, and Uzbekistan. David Leason, managing partner of the intellectual property law firm Leason Ellis in White Plains, is on the vanguard of professionals who previously worked in Manhattan, but chose to set up shop closer to home in Westchester. Each day David passed through White Plains on his Metro North train commute from Chappaqua. En route to New York City, he looked out the window and appreciated that White Plains would be an ideal location given it's position in the middle of Westchester and all it's convenience to people throughout the region. He was right. Since David founded Leason Ellis with his partner Ed Ellis in 2008, the firm has grown to over 25 attorneys and almost 50 employees today. Now situated on a full floor at One Barker Avenue in White Plains, the firm continues to expand as it is currently taking on additional office space on an adjacent floor. Already the largest intellectual property law firm in Westchester County, Leason Ellis is on the path to being among the largest IP firms in New York State outside of Manhattan. Beyond attracting top-notch and diverse talent, many of whom had also been commuting into Manhattan, the lower cost of real estate has allowed the firm to create value for its clients by charging lower hourly rates than comparable firms in New York City. With worldwide patent, trademark, copyright portfolios and experience litigating IP disputes for companies of all sizes, not just in Westchester, but around the globe. Leason Ellis is uniquely positioned to handle the growing need for IP services both locally and internationally.